Classifieds (and business directories), like Social Networking, are a favourite with local tech startups. Very much so you’d think with all this work addressing the classifieds problem, it’d be solved by now. That an ordinary person would be able to easily post an ad to a platform with any device they have and within minutes be getting calls, and hopefully by the end of the day have a couple of serious leads. You know, the way it works when you throw a classified ad in the paper. You’d think with the 72% mobile penetration, the opportunity is clear enough the numerous startups would have cracked it by now. They have not. Newspaper classifieds are still the most effective way to do classifieds in Zimbabwe. Yes, there’s Classifieds.co.zw and Dipleague but both platforms are still largely not found outside conventional web browsing and email. Despite its web successes for example, Classifieds.co.zw doesn’t even have a mobile version of the website. The fact that they knew this and more than a year ago, said they were working on one, only says they are technically finding it difficult to do so. Forget the fact that they could tap into an even larger SMS and USSD market. If anyone can convince a mobile operator to give them a chance, it’d be them. Dipleague on the other had only works effectively via email. It’s basically a mail list where users blast each other with adverts. To reduce the noise (from the mail list blasting) the moderators of the mail list have banned all free webmail email address like Gmail and Yahoo, thereby limiting even further the people that can use the service. Looking at the tens of classifieds sites, you can’t help notice how fully functional the websites are. But that’s only because most are open source projects downloaded and theme-customized into a local feel. So it’s mostly only as “fully functional” as the open source project has gone. Beyond installing the site and announcing it on Facebook and Twitter, not much planning has gone into what the business of classifieds is. Sometimes the content strategy almost looks to be we’ll announce and people will start posting ads and creating their business profiles. As a result, the friends and family, the first people to visit the website, will check it out, congratulate you on launching ‘Zimbabwe’s leading classifieds platform’, then they go on to click around for some content which they don’t find, and because of it, never return when they leave. Some will do you a favour and post a few ads, but they never get an enquiry on the stuff they posted, so again, they really have no reason to return. Just to illustrate that further, the founder of Classifieds.co.zw, Garth Drummond, said it took “over 10 years to really get classifieds going”. And even then, they had to employ some clever tricks to keep the site looking busy and full of content. Dipleague was a different case; the site was launched to solve a simple specific problem – the acclimatization of the diplomatic and NGO community – and “Soon the list took on a life of its own” says moderator Shasha explaining how the site service usage exploded as the effect of hyperinflation rocked Zimbabwe. Starting a web or mobile startup is more than just installing open source software and announcing it on Twitter. The real work is on building the business, not installing software. It’s in understanding the market, the competition, and ultimately the problem being resolved. To be fair, the SMS platform is in the hands of the mobile operators. But surely, short of circumventing them altogether, ways can be found to allow SMS subscribers to send in their ads. In fact the ‘mobile operators are closed’ argument doesn’t hold much water anymore. Startups like ForgetMeNot Africa are actually looking for other startups that’d like to reach SMS subscribers from the internet via their recently launch API. Note: Zimbabwe’s failed business directory startups include one I (and two other people) attempted back in 2008/2009. On realising it was either we scrapped content off existing sites, or we did own data collection, entry & marketing of the service, we quit before even installing the software. Very well thought out article i agree with you, we are very fascinated by launching web products without figuring out the business side of things. PS- Garth Drummond and Classifieds.co.zw should pay you for improving their SEO rankings lately because you’ve been talking about them a lot! I would agree with you, classifieds.co.zw has received more popularity than it deserves. Its no longer news worthy. Its no longer even a start up, its actually a stumbling block to start-ups because they all fall in the mention Classifieds.co.zw especially by writers who believed to have an expert unbiased opinion. Just my views. @facebook-610331826:disqus I agree that funding is limited in Zimbabwe, but in placing the blame squarely on funding, we might as well blame it on Zimbabwe’s image problem that keeps investors away. Point is there’s much we can do as it is in a lean way to make do with what we have. You say yourself that some have won relatively decent amounts of seed capital to get their business going in startup competitions locally. Their failure to capitalise on the funding and mentorship points to something else that’s not money. true that i do not believe that it is a issue of funding. “if you build it they will come” if we create brilliant projects people will fund them. at the moment there aren’t that many innovative start-ups on the scene. at least for most people i know who are doing it, it is an issue of funding. you see progress on their work the few times they get some resources. “if u built it they come”, that happens to be different in our country. only recently that is when internet started penetrating to a sizeable number of people. my firend the innovative start ups are there in the “garages”. the ecosystem is just young but i promise you will be shocked one day to work to some Zimbo tech stories, the ones that do not come through hubs or competitions. There are two Start Ups so far that I believe are going far (Zimbile.com)http://www.biztechafrica.com/article/zim-start-challenges-africas-mobile-landscape/2365/ and some gus (Maharis), they create an animation software in the mould of the likes of 3D Studio Max-they are an inspirational team indeed! by the way we do not stop pursuing our dreams because of even lack of funding, we know one day zvichaita chete. in holiday they say “IT TAKES 15 YEARS TO BE AN OVERNIGHT SUCCESS”. The headline of the article alone got me tired to respond because this is a contentious issue here on Techzim. The number one reason people use open source software and claim to be whizz kids of some sort is not because of finances but rather, a lack of creativity, imagination, and most of all, programming skills. You have a bunch of people who will download a CMS of some sort, install plugins, and go live claiming to have created Facebook. I have always said it and i wont budge, unless people learn how to code and create their own systems from scratch there is nothing new they can claim under the sun. Facebook can, at any time it wants to, launch a new function (friend request) because it has the programming skills and creative geniuses in-house. Now vana bhudhi mukoma vedu will just download some CMS, attach plugins, launch, and go to the Herald to announce they have built a social network. Beyong the basic capabilities of the open source CMS and the plugins coded by other people, there is no new function they can add because our bhudhi mukomas do not have the know-how to develop the plugins, they do not have the programming skills. Some of them will even tell you it is better to download opensource than create a new thing. They have no skills and/or vision to build their own WordPress, whatsapp etc. One thing i agree with @facebook-610331826:disqus above is that perseverance and determination to succeed is what it takes. You hear folks say why create a new operating system when Windows already exists. In South Africa, Mark shuttle worth started Ubuntu, which is a fast growing opensource operating system which even many Zimbabweans are using, and even the Computer Society of Zimbabwe offers on its website. I am a writer and i see no difference in the processes that go into coding and publishing software versus writing a book and publishing it. You can build a software program from the comfort of your home, just like writing a book. It is very cheap to do. I would have loved to know which 10 years it was. If it is 2000 – 2010, then that is understandable with the economic situation. otherwise if everything was OK, it would probably have taken 2 years. Besides, internet access was not as available as now in those 10 years. As for the business case of Zim open source implementations … You should have mentioned Tengesa.com. It claimed and still claims to be the first mobile site in Zimbabwe which is not true. Anyway, they continue to emphasise that “frist” point and months later, they still do not have any ads at all. people who implement open source project just implement them, make noise that they are the first in Zim, and no one ever knows or hears anything more about them and their sites. And besides, Classifieds can easily go mobile today. Some internet business ideas are nice but not realy well thought out. And when you say it, you will be called negative. But hey, if you believe in it, don’t listen to our judgements. Just go ahead and do it and prove us wrong. Normally i have the patience and energy to respond but as you can see to day i don’t. And that is why my response is brief. Maybe another day. @Prosper Chikomo, I like your comment but there are a couple of things I happen not to agree with you on. First: Open Source Platforms are just frameworks to start from, what you do with them,is up to you depending on your skills and financial resources. EBAY uses Joomla for example but an ordinary eye won’t recognise that. The reasons why I mentioned the FINANCE ISSUE is that; for you to be seated at home and program, YOU NEED TO EAT, YOU NEED TO PAY BILLS, TO SUPPORT YOUR FAMILY, YOU NEED THE INTERNET, unless you have someone to do that for you. I do not know whether you writers just sit at home and spend time writing books without an initial income, you stand to correct me there. Writing a book and writing software are different things. For a book you need a pen and a paper BUT if you need anything more than that, well that is researching and that will be standing on the shoulders of giants, using already available sources, when you wrote the history of De Beers and SA diamonds stories you obviously EXTRACTED that from ‘open’ sources which other people wrote before you…so brother mukoma if you where in the software and website development business we would say you are USING open source systems. Otherwise the difference between your work and your source is how you are presenting your work! On the streets and everywhere there are many people with great ideas, some for business, some for books, some for inventions, some for music,some for what not (BUT THEY DO NOT HAVE THAT OPEN SOURCE FACTOR-THAT YOU CAN CHEAPLY SET UP SOMETHING AND TEST YOUR IDEAS)…BUT free open source platforms allows anyone with some knowledge on programming to download and pay for a domain and hosting (maybe 100us/year) and get you guys to critisize him and in the process gain knowledge, make friends and enemies AND MAYBE EVENTUALLY START UP succesfuly.I use open source cmss but I have many people who do not believe my projects are open source. I iterate on the platforms and built what I want from there. I got satisfaction in serving the world that way. I wonder whats your opinion on the Techzim.co.zw platform where this story is written which is also on an open source cms (WordPress). IN ALL FIELDS SUCCESS DOESN’T COME SO EASY. IF YOU HAVE THE RESOURCE TO EXPERIMENT YOU CAN FAIL FAST AND MOVE ON, BUT IF YOU BELIEVE IN SOMETHING AND YOU HAVE SEEN THE FUTURE, YOU PERSIST AND PERSEVERE AGAINST SETBACKS, DISCOURAGEMENTS. IF YOU QUIT BECAUSE PEOPLE SAY THINGS ITS UP TO YOU. THE SAME PEOPLE WITH DEROGATORY COMMENTS ARE THE SAME ONES WHO WILL BE PRAISING YOU FOR THE SAME THING THAT THEY COULD HAVE BEEN AGAINST! Some of the people you mention in your works as geniuses fought court battles to get to their dreams. The technical know how was not even an issue. The challenge we face in pursuing our dreams sometimes are not in any formula. Most of the open source systems are installed by people who are pursuing other dreams, they are probably not into this full time. Talk to Garth Drummond and you will get to the story of why it took ten years for Classifieds to make sense. The point in the article (not neccessarily @55eda97a25a3b60bf00a370fa6836a8f:disqus ‘s point) is that installing WordPress and theme-ing it should not be the whole plan of the business. WordPress (Joomla, Drupal etc…) are just a utility. Great Job L.S.M. Kabweza . Tech Zim must be the most successful Worpress based biz in Zim and the rest of Africa. You hit the nail on the head as to why money is one of the most critical issues. those who doubt this should watch their otherwise well thought and growing software house go up in smoke because zim comapnies could no longer afford enterprise software. As a software developer and budding writter (I have finished a Strategy and Tech management book wich is currently receiving quite good feedback from reviewers) I can tell you that the two are quite similar and they both need money for the reasons you articulated so well. Now your reasons for saying writers depend on open source support is not correct. For a software developer to build meaningful software they need to go through a lot of code written by good designers. They will learn how to handle objects by looking at samples and trying them out. they learn a pattern that works for their thought process. The same with writting a book. You will comment on the five forces model but you will have to write quite a bit about how it fits in with your theme Most of all you will have to say what are the limitations of the five forces model. You will have to build your own improved model and say why it is more aligned to your book theme than the five forces model. That my friend is hard work. And yes, you will also have to find the money to pay for the beacon whilst yoou are doing this. The reasons why I mentioned the FINANCE ISSUE is that; for you to be seated at home and program, YOU NEED TO EAT, YOU NEED TO PAY BILLS, TO SUPPORT YOUR FAMILY, YOU NEED THE INTERNET, unless you have someone to do that for you. I do not know whether you writers just sit at home and spend time writing books without an initial income, you stand to correct me there. I think this is where history was, and still is on my side. I wrote my book when I was in my early 20s, when I was a full time student, and went for years without a publisher until I decided to do it myself and even learned some coding and now my book is sold on Amazon. I had very few responsibilities a la wife, kid(s), siblings etc. Zuckerberg of Facebook, Bill Gates and Paul Allen of Microsoft, Jerry yang of Yahoo, all these guys started their businesses before they were 25 or 30 years old and were all not married. There is no difference between writing code and writing a book, and even the publishing process. Right now, I wrote my book, and had to learn code to publish it on Amazon.com. It didn’t end there. I eventually, in the end, created my book in a java mobile app format where you can read it on a 2G G-Tide phone (apart from other formats). I taught myself some code. I had to because, for example, a mobile app can set you back US$20 000 to be made. But I went further than that, teaching myself. I eventually got to the point where I am now where I can build a mobile site myself for the cost of my time. Now, to answer your question, there really is no difference. With your programming skills, you can create your own iPhone app and sell it on iTunes. No difference at all with what I am doing with my book on Amazon. If having a family is the excuse for one not to start something original and refreshing a la Facebook or Whatsapp, then I can’t really expect a Strive Masiyiwa, to say the least, out of one such. Strive Masiyiwa was married when he started Econet. Nigel Chanakira was married with kids when he started Kingdom Bank. Herman Heunis whose Sunday Times bio I have was a family man when he started Mxit. I wonder whats your opinion on the Techzim.co.zw platform where this story is written which is also on an open source cms (WordPress). I am not trying to be too technical here but, Techzim is not an open source cms but rather a media business, or, a blog. It is important for me to highlight that so that you do not misunderstand what I am going to say. Techzim provides information, that is it’s job. It is not in the business of software development, or offering websites a la WordPress.com. However, if it was going to offer websites (like our brothermen) Project Brandify-style, naturally my recommendation would be that Techzim creates it’s own software rather than use WordPress. Blogger, which was bought by Google, was a different software created by its owners, it was not using WordPress. If you want US$millions funding, either get millions of customers using open source software to provide a service, or build your own software, which is why I say people should learn code and not just call themselves expert programmers when they just joomla, which even the uneducated chicken I am about to eat can do. VCs lookfor projects with unique selling points; projects that have potential of earning them their money back + capital gains. There is a world of difference between developing software and coding – conflating the 2 is a common amateur mistake (the fact is most of the work is done by the time the IDE is launched). Here’s the thing that most people who have just started coding usually do not know: most of the (generic) code you write has already been implemented better, by someone more intelligent than you are. It’s usually a Google search away, but of course that’s anathema to you and your ilk, because that’s “joomlaring”. You most certainly do not need to code your own framework, or caching mechanism, or ‘encryption/security scheme’ (worst offender). The rule of the thumb is: if it’s not domain-specific; it’s a solved problem. Move your attention to things worth your attention. P/S: since you deign to give coding advice, let me return the favour – it’s “If I were married and had a child…”. Since the context is business, lets eliminate the designers or developer who create websites or solutions for their clients. Talking about people who want to model some service or business around technology, like the guys quoted here, this is MHO. Building from scratch wont gaurantee you a product that sells. You can offer a bad service or product whether you write software from scratch or you utilise opensource. The success of your product is not a function of what you use but how you use it, present it and how you make it relevant is to your intended market. your will, the software you have before you. Access to its code to make it do exactly what you want. Let us assume we are talking about a talented programmer with a business in mind. I dont know how well you know about software development but ALL modern day languages are a collection libraries, frameworks, abstractions and all being just commonly used features built into a language. Some of which taking advantage of the platform they are targetting. You do not have to define your string manipulation function, you do not have to create your own dialogue window, interpreter or compiler, or create your own markup language to define and browser to render a webpage. You build upon time-proven methods, standards and algorithms. This is not JUST an opensource concept. Its all things SOFTWARE. I am making the assumption that you understand, have exposure or do alot of programming. In which case I know you probably understand everything I am saying. and personal responsibilities. It makes business sense to assess what is available to you to BUILD YOUR PRODUCT/SERVICE. If there exists something you can build upon that uses best practices and is well implemented, use it!!! Again, I am not talking about the “designer” or “developer” who downloads Joomla/Drupal/Typo/DotnetNuke/Wordpress… a template, a few plugins then gives it to the client. I know good programmers who can hold their own in whatever their language or domain they specialised in. All capable of creating the next big whatever. But other than the challenge of business creativity of coming up with an idea that sells, they just do not have the time and resources to do something. Guys like the classifieds.co.zw guys have more clout than the average Zim day-job-developer/grad student with no laptop/computer, personal internet connection, money to pay for 3rd party services(doman registration & hosting)….and supporting a whole lot of siblings and extended family. I am going to try very much to be brief. Just like downloading open source CMS as evidenced by many sites, a number of which are mentioned on this page. They are not making any money with that open source software. You have a serious misconception about opensource. I mean this in the least offending way. I urge you to research into the opensource philosophy. I may be an author but I understand open source very very well. I have extensively used, installed, amended, and even fixed some open source software which I will just let you know that I know, tend to always use MySQL. I wouldn’t talk about joomlaring unless I knew what joomla is, and not as a good or bad implementation. I have even gone further to study the economics of open source software, and it is from the business and economic standpoint that I tell people to learn to code, and better still, code their own software. If open source software was not profitable, and a massive business, you would not be downloading anything. And what then would you be doing? The people who are making the most money in the world, like, really get filthy stinking stinking rich, and I am talking of hundreds of millions of US dollars and even billions, are not people who play Angry Birds, spend the whole day on Facebook, joomla US$250 websites for people, or people who blog on WordPress, or those who use Microsoft Office, NO. The people who are making the most money in the world, like, really get filthy stinking stinking rich, and I am talking of hundreds of millions of US dollars and even billions, are those who write the code, and even own it e.g. Bill Gates (Microsoft), the guys behind Angry Birds, Matt Mullenwerg – the (now multimillionaire) founder of WordPress, and more famously – the now multimillionaire co-founder of Facebook, Mark Zuckerberg. Even those who have made money from iPhone apps coded those iPhone apps, or hired coders and yet own the apps, they did not just download open source software and joomla it. You will never be anything if you do now own the software; and therefore, cannot write code, or even manipulate it. Nothing is as important as coding skill in the internet business. The idea of promoting laziness in the name of so-called freedom which really is limited (and not re-inventing the wheel), and inculcating a culture of national insecurity as well as skills depletion and monopolization on a worldwide scale, dumbing down what should be the smarts of any country, is what I will never support. Indeed even Microsoft based its first product on BASIC that was already in existence, but Bill and Paul knew how to code, and did write code, and the Windows code is theirs. I will now illustrate the dumbing down issue. Despite its web successes for example, Classifieds.co.zw doesn’t even have a mobile version of the website. The fact that they knew this and more than a year ago, said they were working on one, only says they are technically finding it difficult to do so. I think the Classifieds guys/Webdev have done a fine job of a business with Classifieds which I understand, if one post on another thread sometime ago is to be believed, is powered by Joomla. This is what I will say if Classifieds is a joomla implementation. And that is exactly what happens. People are dumbed down by open source software to never create anything of their own. There is not even one plugin in the entire joomla plugins directory that was ever made by Zimbos. If I had a computer science/software engineering degree and I joomlared too, I would be ashamed of myself. Yet if you go to WordPress; Kenya and South Africa have contributed plugins. In terms of plugin/software development reputation, do you then think US/EU investors would even think of Zimbabwe? No, because there is nothing a Zimbo has to show, virtually nothing he is known to have contributed. With Kenya and South Africa, Mpesa and Mxit are doing the marketing for those countries’ coding expertise, and that is where VCs will flock. Just like with India. From what I have read in some comments, it is obvious to me folks do not understand real story about open source software. “Open source” software does not mean free, it simply means the code is open for scrutiny and manipulation; that, in itself, is a huge difference. And that is exactly what happens. People are dumbed down to never create anything of their own. There is not even one plugin in the entire joomla plugins directory that was ever made by Zimbos. If I had a computer science/software engineering degree and I joomlared too, I would be ashamed of myself. No one denies that coding mastery is fundamental. we have to consider these other factors. the business ideas robustness, harnessing resources, innovation and deploying it timeously.Honestly in dont think 99,9% of facebook users care how and what was used to develop it. What matters is the idea’s usefulness to the consumer and not replicating a model that is already out there. Coding is simply implemention of a desired outcome. Should one waste time thinking of algorithms for a solution that has been solved?, point is. if solutions to parts of your program specification exist, use them and focus energy on that “never-been-done” part . Ubuntu’s Mark Shuttle worth did not rewrite the linux kernel which ubuntu is built on, in fact his idea was to create a free desktop alternative to windows. IMO the project simply involved obtaining a free Linux kernel, free window manager/desktop from the Gnome project, bundled some useful open source office applications and customized some features. Not to discredit his work but all i am illustrating is how they achieved the desired goal which was developing a linux OS for the average dude who thinks the phrase “command line” has something to do with the army. Personally i do not advocate for over reliance on CMS like joomla. These tools don’t make one a programmer inasmuch as owning a copy of Corel Draw makes one an artist. Open source helps in achieving goals faster better get a new brilliant concept out there first before someone else does. i’ll conclude by quoting one writer “EITHER YOU ARE NUMBER ONE OR NOTHING!” – PROSPER CHIKOMO. Why take ages re-inventing the wheel? This is business and in business you don’t do everything. Facebook founder was a genius enough to turn his fascination to something big and the truth is neither you know me will be the next coders of the next facebook. 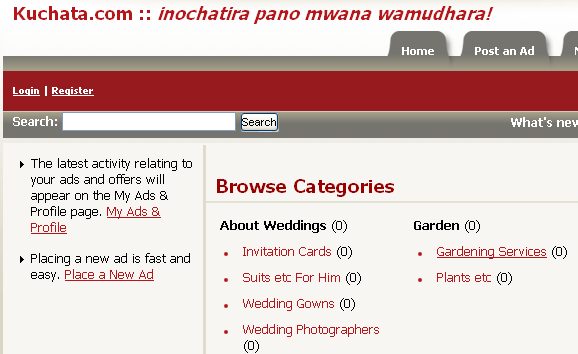 Kuchata.com; inochatira pano mwana wamhudhara!!! pamuonde.com stil under construction..from scratch. good article…..the bottom line is Zim is not ready for more than 3 dozen classified sites that have graced our internet. You can build from scratch and create the best site but content wise, u will definitely struggle. Unless and until big companies start respecting the power of internet advertising, classifieds start-ups with keep struggling. We need the backing of banks, telecom companies, car dealers, insurance companies, etc to at least have a guaranteed income every month. I have one that is struggling and I am already contemplating pulling it down until things improve. the bottom line is Zim is not ready for more than 3 dozen classified sites that have graced our internet. You can build from scratch and create the best site but content wise, u will definitely struggle. The laws of the internet jungle still applies, even to Zimbabwe. On the internet, at a global level, and even at the level of Zimbabwe, there is no room for number two and you can’t afford to be. If you are number two, you had better be while growing fast enough to dislodge number one otherwise there is no comfortable number 2, 3, or 500. This very fact alone means venture capital will flow to bigger internet businesses/start-ups while the next contender starves to death. I shall now illustrate. The big daddy of online auctions in eBay. Guess who is number two in the online auction business? I bet like me you do not even know? And why should you and I care who is number two? And do you think online auction customers care who is number two? With just these few facts in mind, which business do you think venture capitalists will want to put their money in? The number one or number two? IN ONLINE BUSINESS, THERE IS NO COMFORTABLE POSITION OF NUMBER TWO. Let us now go to social networks. Already you thought of Facebook. But which other one did you think about? None. Maybe after doing some differential equations you thought of Twitter and wondered if you could call it a social network. Basically, Facebook is number one because when you mention the word social network, many are quick to use Facebook as the standard of what a social network is. There is no room for number two. And just which social network has been funded the most in the world? It’s not China’s Tencent which has equally comparable subscriber numbers but Facebook, the number 1 social network in many countries. Let’s go to search engines….. So what is the moral and how does it apply to Zimbabwe. You can build from scratch and create the best site but content wise, u will definitely struggle. If you are number 2 going to the bottom you will. This is where I say to folks they should innovate and do something somebody isn’t doing. Sadly because of open source software, once some folks see Classifieds.co.zw succeeding, they think its easy to do. They then joomla and go on to compete against Classifieds which already claims to have over 25 000 members. What incentive is there for someone to leave Classifeids.co.zw to even visit (not join) another classified ads site. With claims of over 14 000 adverts, I know that if I go to Classifieds.co.zw, I will definitely find something. Now if number 2 is just stating and has 20 classified adverts, all of which were posted by the owner, why would I waste my time going there? The moment I see 20 adverts I tell myself Classifieds.co.zw is still the best. Regardless of a horrible user interface etc. There really is no room for number 2, either you are number one or nothing. And the best way to be number one is to do something nobody else is doing. In my experience, a good idea with monopoly potential a la Classifieds.co.zw will never fail to get potential sponsors. Man, I could go on and on and on the funding issue. from an online classified website. Below are a few features of a good classified website. Social netwok links – Almost everyone is on facebook and almost 40% of internet users are on Twitter. A lower percentage is beginning to appreciate google+. And no one can afford not to have a Google+ button next to their ad if they want their ads to rank high in search results. A social friendly classifieds website should have the entire 3 main social button for ad promotion in social networks. Social links should also not seek to promote a classified website but an individual advert. Internet users are too busy to follow a lead that leads to some home page but they will be eager to click a link that leads to a specific advert. bad advertisers will continue to rip off buyers and good advertisers may go unnoticed. Design – the design of classified website matters. Some designs are just outdated, the picture quality is poor and most of them have literally sold their souls to Google banners that scream “click me”. They expect people to post ads freely and they cash in on Google Adwords. A lot of banners ads distract the attention of a potential customer. Click should be limited to the same website either by displaying similar ads or having other advertisers with the classified ads post banners. Why get the traffic and then try by all means to send it away to other websites. for directions to an advertiser’s office or workshop. This should be within the classified page. Storefront – a good classifieds website should have a storefront that lists all ads from the same advertiser. The storefront should include the advertiser’s logo or banner. Store should be rated and offer the website visitors more information. category. This simplifies and speeds the ad posting process. If you read the article it actually says they have a major shortfall, something new startups like tengesa.com are trying to address. What is remarkable about classifieds.co.zw is that they have managed some success building an internet business. So far, it’s something that has only been achieved by a few internet startups in Zimbabwe (them, NewZimbabwe.com, Zimbojam, Zimazon, Dipleague and a few others you probably already know) If by talking about those few successes we commit a crime of favouritism, we are guilty as charged. point of correction, newzimbabwe.com is highly success, but was it really started in Zim? its whois records says otherwise and Mthuli or the owner doesnt he lives in Leeds or Manchester? @facebook-626384278:disqus i am sorry to tell you that your site is disappointing. After reading ur comment i was really looking forward to being “WOWed”…i was wrong! You look and feel only fits a pretty boring personal blog, not a classifieds site that is supposed to attract visitors. Here is why…1). Colours – surely you could do better!2). You put both featured ads and latest ads on the home page….come on dude!3). Using my 15 inch laptop, all i see (before i scroll down) is a lot of useless text that doesn’t help me in anyway and an ad that is too big for nothing and some featured ads that look lost! I then have to scroll down to find the reason i am on your site! 4). content – the biggest problem in Zim. Do something about it dude. Noone will come back to visit a site with less than 10 items. I think you should get a designer to join your startup. You could also learn a lot by “analysing” a design like this www.olx.co.za and ask yourself why it is that apealing to the visitor. I hope this criticism is as constructive as i think. Hmmm, Mr developer you are so transparent! How can you turn a friendly comment into a war zone? Anyone can see that in your eyes. Whom are you speaking for? Do you have anything that we can talk about? You didn’t have to be so transparent At least i didn’t act like one, I kept my comment professional and to the point and all you chose to do is to ignore my comment and attack a website I referred. There is more to online advertising than colors unless if you want to compete with TV ads. This is web marketing not TV or brochure advertising. Having featured and latest ads is the best way to go dude. People pay to be on the featured section and people want to know the latest ads and all that has to be on the first page. I’m not surprised you didn’t like the text because it’s what matters, it’s what will enlighten people on what to expect and I understand why you hate that. You prefer it when people are doomed to rely on some service provider thought to be some kind of a god. That’s a layman’s approach to marketing. At least now I understand why start-ups fail, they are condemned before they begin. No one will doubt that you’re a mouth-piece of some classifieds website. I thought this blog was all about writing news worthy and informative articles that help consumers make sound decisions. I guess I was wrong, I foresee start-ups crashing at the mercy of your remarks. I expected better from you Mr developer. I’m no tech savy guy, or some programming wizard that most claim to be but with nothing to show for, I’m just a businessman, an investor, someone who understands what is needed and what people want and am determined to do that as long I’m in business. I have a business strategy in place, professionals working with me and a dedicated team to do the job. I’m determined to succeed regardless of negative comments from people like you. On the other hand am grateful you came out so clean and transparent, your criticism was noted and your contributions will not go unnoticed. Necessary steps will be taken. Those with an unbiased approach I still encourage you to place your ads with classified-ads.co.zw for better results. Surely you cant let or believe that harsh comments or criticism would make your start-up “fail” or “crash”. Just do it. if it fails, its a lesson learnt. one commenter even admitted his failure, if you have something you think will be different and you think remarks, opinions and comments will make you fail… then business will give you stress. esp tech. esp web. where you are out in the open. @facebook-626384278:disqus Word of advice: When u advertise urself to the public expect both negative and positive comments. Not everyone agrees with your line of thinking so expect anything. Benedict Mdluli Nyathi l also checked your website, l like the simplicity on it but please dont take it personal, some people have direct approach which might sound nasty. Even with a very wide screen, your site looks crammed and difficult to read and find things. You seem to have mixed a lot of colours which now looks like patches joined together in a hurry. lt looks like you are promoting cars more than anything which is leaving a lot of spaces on your site yet everything else is squeezed on ,much smaller space left. next time you want to criticise other websites to promote your own website on a public forum, be prepared for peoples opinions. @kthaker:disqus I CANT AGREE MORE WITH YOU. i think Benedict is the type of person who would rather have pipo lie to him about his ideas that tell him their HONEST opinions. @facebook-626384278:disqus i would not want to start arguing with u since you are not open to different opinions. You come here u start advertising ur site and you expect all praises. I don’t think that a good mentality for this Forum and your business. We all have freedom of expression and you either take it or leave it. Man! you just got pointers on what to work on for your start up(priceless). the least you could do is be grateful and say thank you to Developer. We not here to please each other but instead with this kind of truth, we are building each other. And another one joins the array… http://www.classifieds247.co.zw , same design, same layout, same script…boring! wasn’t sure about at first. The problem for me lies within the familiar forms of gameplay.